Bogeschdorf is situated in the Zwischenkokel area and north of Mediasch – in the 14th century the village belonged to the Mediasch chair as a free royal soil community, then to the Großkokel county and today it belongs to the district of Muresch. The village was founded in the last settlement period of the Transylvanian Saxons, which fell in the 13th century. It was especially known for its successful viticulture. 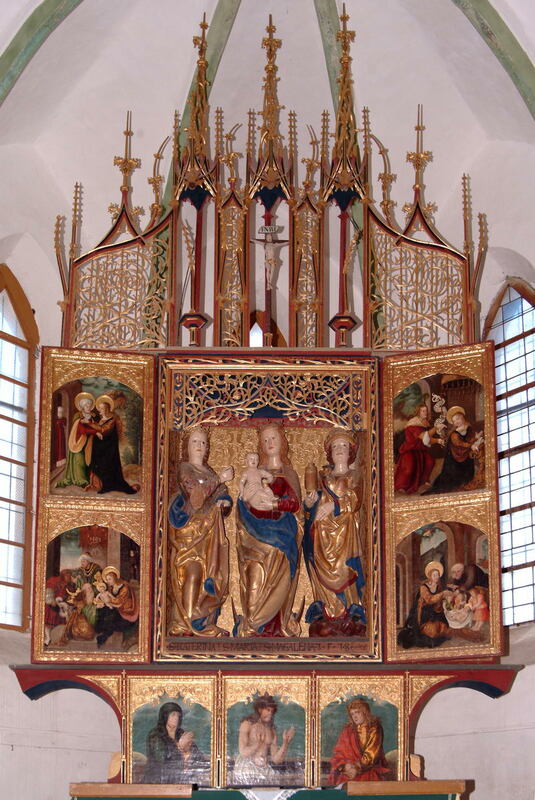 In this year the Bogeschdorf altar became 500 years old – an anniversary on the occasion of which the Fortified Churches Foundation would like to point out this outstanding sight: The late Gothic altar dates from 1518: It dates therefore of the period of pre-Reformation and is attributed to Johannes Stoß from Schäßburg, the son of the Nuremberg sculptor Veit Stoß, who is also the creator of the altar of Mary in Krakow from 1489. Thus, there are parallels between the two altars, especially in terms of colour. The Bogeschdorfer altar is also one of the best-preserved altars in Transylvania. When open, the altar presents three figures: Saint Catherine, Mary with Child Jesus and Saint Magdalene. The two wings show the four biblical scenes of the Annunciation, the Visitation, the Birth of Jesus and Marian devotions. 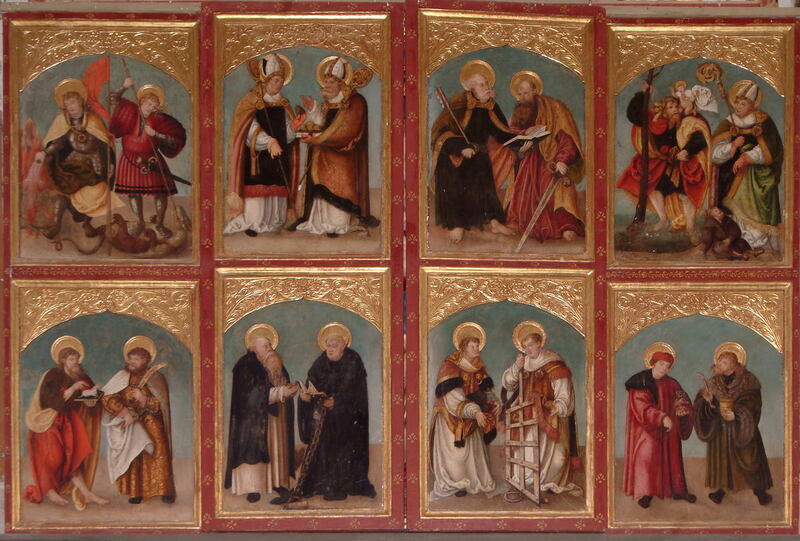 Closed, the altar on the workday side shows 16 saints to the visitor, who are always depicted in pairs – although not all of them could have met because they lived at different times. For example, Pope Urbanus (222-230) and Bishop Nicholas of Myra (died 351) could not have met. The predella unites three golden images into one: Jesus, who steps out of the open tomb, stands in the centre. To his left is Mary as Mater Dolorosa, to his right the disciple John. The splendid, towering blast, decorated with five towers and numerous columns, is also very well preserved. Further valuable information and curious details about the altar can be found in Rolf Binder’s commemorative publication „500 Jahre Bogeschdorfer Flügelaltar“ („500 Years of the Bogeschdorf Wing Altar“) – it describes the altar in detail on 40 pages: the reader can find out here about the „Antoniusschwein“ („pig of Antonius“), the owl of the choir stalls or about the parallels to the Isenheim Altarpiece. In which region did the father of the sculptor of the altar of Bogeschdorf, Veit Stoß, presumably receive his education? After our draw the winner will receive a church castle memory. Please send your submissions by 31 October to ab@kirchenburgen.org.